After the final curtain of Swan Lake, an animated crowd exits the Mariinsky theatre brimming with excitement from the night’s performance. But outside the scene is somber. A ballerina’s body lies face down in the snow, blood splattered like rose petals over the costume of the Swan Queen. The crowd is silenced by a single cry― “Nemetseva is dead!”Amongst the theatergoers is Lady Emily, accompanying her dashing husband Colin in Russia on assignment from the Crown. But it soon becomes clear that Colin isn’t the only one with work to do. When the dead ballerina’s aristocratic lover comes begging for justice, Emily must apply her own set of skills to discover the rising star’s murderer. Her investigation takes her on a dance across the stage of Tsarist Russia, from the opulence of the Winter Palace, to the modest flats of ex-ballerinas and the locked attics of political radicals. 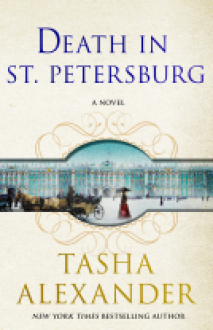 A mysterious dancer in white follows closely behind, making waves through St. Petersburg with her surprise performances and trail of red scarves. Is it the sweet Katenka, Nemetseva’s childhood friend and favorite rival? The ghost of the murdered étoile herself? Or, something even more sinister?